If you are loving the copper trend that Tom Dixon and Jaime Hayon rocked the design world with in 2012 then you will be tickled pinky gold to know it is showing no let up in 2013. But no matter what we saw mixed in with shades of bronze and gold in Milan nothing compares to our magical metal find from Retropolitan, a gem of an Art Deco teapot discovered at the latest Midcentury show at Lords. Perk of being the organisers, we get first dibs. Lesley McNamee, our resident home accessories genie sold it to us at a snip of the hundreds of pounds it is worth and we are eternally grateful. 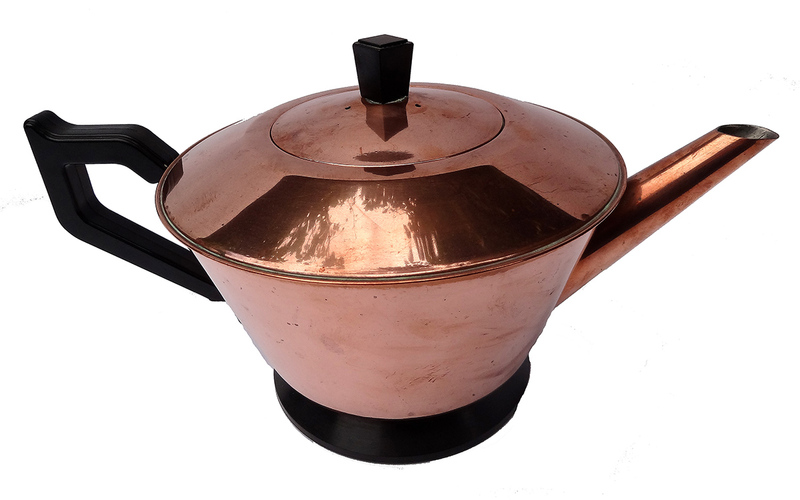 Copper was a huge trend in the time of art deco and then in the late Fifties. To really see it at its best check out the work of Eileen Gray and master of lighting Poul Henningson whose incredible artichoke light in copper for Louis Poulsen is our very favourite. As the Sixties turned into the Seventies more and more copper lampshades appeared in the UK and abroad in all sorts of wonderful shapes and sizes that have inspired much of what you will see in hotels, restaurants and the bars in all the major cities today. More copper? Bring it on….